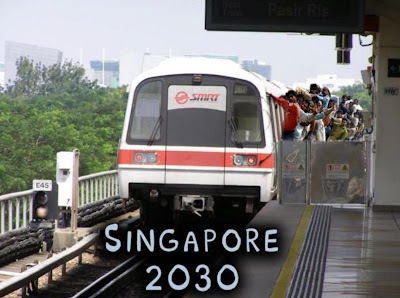 Singaporeans’ comments blasting the government came fast and furious after news broke Tuesday of its plan to allow for an increase in the city-state’s population to 6.9 million by 2030. Coming amid an already rising wave of anti-foreigner sentiment following the influx of immigrants in recent years, a white paper released by the National Population and Talent Division on Tuesday said that Singaporeans were expected to make up little more than half or 55 per cent of the projected population. Foreigners, who currently make up about two out of five people living in Singapore, have been blamed for the rising cost of living, stagnation of wages and crowding in public transport. Singaporeans took it to online platforms to give voice to their rage over the government’s population plan. A Facebook group, Say No to an Overpopulated Singapore, was started on Monday and has since gotten 658 likes. Hundreds of comments to articles regarding the population target were also overwhelmingly negative. Another reader Seasand123 said, "I would consider the mother of all policy blunders ever made by the ruling party is their open door policy and flooding this tiny nation with millions of foreigners." Social activist and owner of unemployment support site Transitioning.org Gilbert Goh told Yahoo! Singapore that the population expansion plans shocked him. “It will cause a lot of social tension between foreigners and Singaporeans. When there are so many people coming in, you have to get them jobs and housing, and these two things will affect Singaporeans a lot,” Goh said. “We have to produce about half a million to 750,000 jobs to accommodate a population of about 6.9 million,” he added. The former National Solidarity Party (NSP) member said he will be organising a protest at Speakers’ Corner at Hong Lim Park on 16 February. “[People I spoke to] are disappointed with the government for not hearing them out. 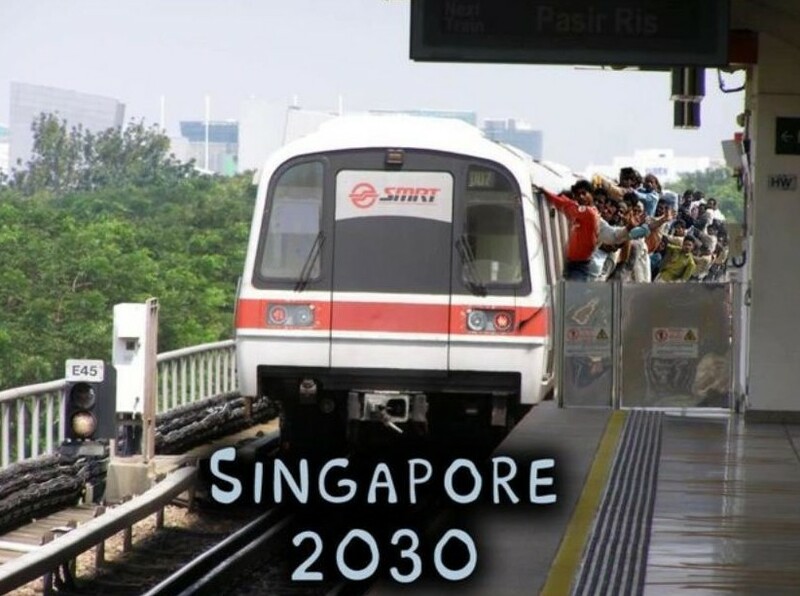 The majority of Singaporeans don’t want this expansion. The disappointment is that after the PAP’s loss in Punggol East, the government still went ahead to introduce unpopular policies,” Goh said. Immigration policies were one of the hotly debated topics at the Punggol East by-election in early January. Yeoh Lam Keong, adjunct senior research fellow at the Institute of Policy Studies (IPS) and Vice President of the Economic Society of Singapore, told Yahoo! Singapore that the government should be trying harder to cap total population at 6 million or below by 2030 and around 6.5 million by 2050. This will involve constraining workforce growth to 1 per cent between now and 2020 and around 0.5 per cent after that rather than the 1 to 2 per cent between now and 2020 and 1 per cent thereafter proposed in the government white paper. Arguing that the positive economic benefits of the higher proposed growth in workforce do not outweigh the negative societal consequences that will come with the larger expansion of population size, Yeoh said economic history of other developed countries like the US and Northern Europe indicated that such higher workforce growth and related immigration is unnecessary for a vibrant economy. He explained that the 0.5 to 1 per cent difference in extra annual workforce growth may be the difference between a liveable and cosmopolitan but reasonably indigenous and more egalitarian environment like Switzerland, and a horrendously crowded, unequal and highly foreign environment like Dubai. "The problem I have with the white paper is that the tradeoffs considered between good jobs and economic dynamism, and population and workforce growth are overly mechanistic, economically simplistic and astonishingly sociologically and politically naive," Yeoh said. With the proposed 6.9 million population by 2030, Yeoh added that Singapore might be moving towards Dubai, where there is difficult social tensions and little national soul. "In short, it proposes trading the birthright of our basis for national identity and social cohesion for the dubious pottage of 0.5 to 1 per cent extra workforce growth on the narrow, unsubstantiated belief that it somehow makes for a more secure and vibrant economic future," he said. In the same vein, Singapore Democratic Party (SDP) said the intention to raise the population to 7 million is "extremely worrying". "There are no justifiable reasons for the PAP to raise the population by such a large number in such a short span of time. The population explosion will cause further economic, social and psychological stress for the people, as well as add to national security implications," said the SDP. 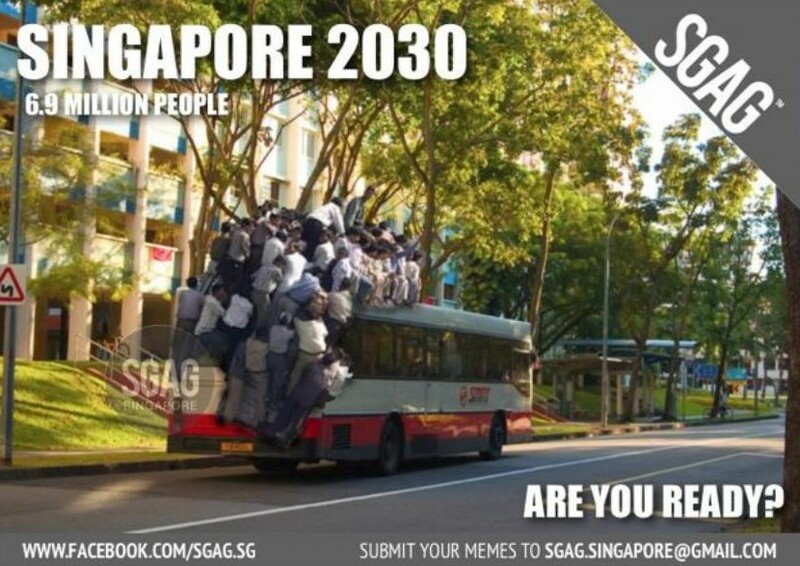 Other Singaporeans have expressed their frustration with humour, sharing memes made by popular satire website SGAG.